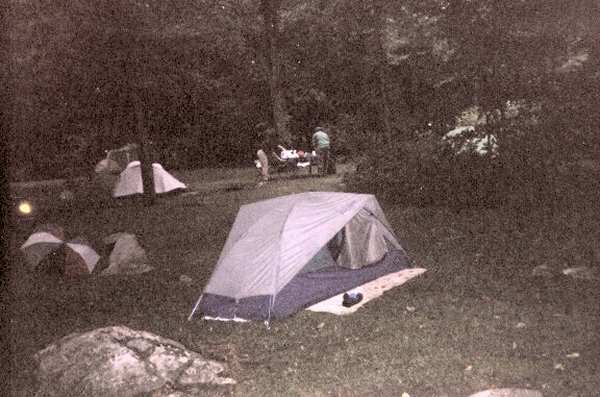 This backpacking trip occurred the weekend of July 23-25, 2004. It was a 14.7 mile loop consisting of the Bridge Hollow, Bald Ridge, Tearjacket and Ramsey's Draft Trails. Participants were Christine DiLapi, Frank Maida, and myself. Friday, 7/23/2004- This is the third time this year that this has happened. The weather forecast for the weekend of a planned hike is "iffy". It rains cats and dogs on the Friday night of the optional campout the night before the hike. The weekend weather is great for the hike. Then, on the way home it rains cats and dogs. And it rained at home during the hike. That's exactly what happened again this time. I got to Walnut Hills Campground near Staunton, VA, our optional Friday evening campsite, at around 7PM. This is a nice campground. It is primarily suited to RV's and has some neat cabins and cottages for rent. 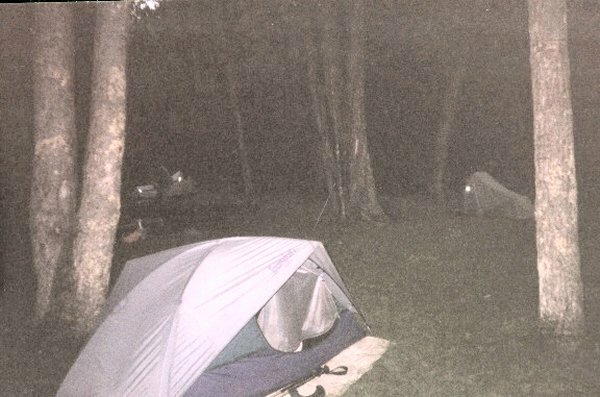 However, I thought that their tent sites, which were very nice, were expensive when you started adding additional tent and car charges, and the fact that I had to get another site because they had a 2 tent site limit. It had started raining hard about a half hour earlier. Frank M and Christine DiL were huddled beneath the rear tailgate of Christine's vehicle dodging the rain. The rain did let up as I arrived. Then, we went to an Italian restaurant in Stewart's Draft, VA for some dinner. We returned around 9ish. Frank M did not get one of his customary excellant camp fires going because things were too wet. So we sat around the wet picnic table, "kibitzed" for awhile, then retired for the night. The route of this hike was still under discussion at that time. The rain had stopped and it was a warm night due to cloud cover overhead. We slept well. 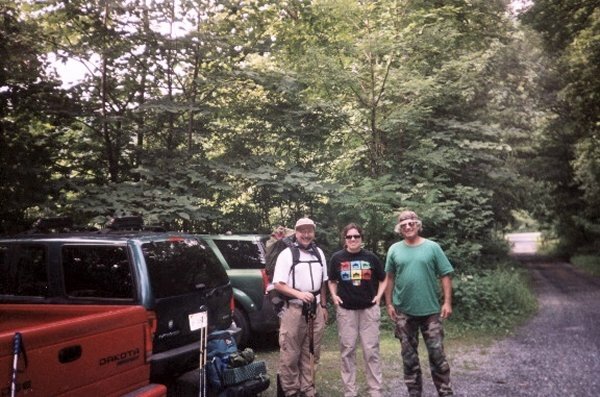 Saturday, 7/24/2004- We woke up early, packed up and departed around 9ish for the Ramsey's Draft trailhead. We got there and were on the trail around 10ish. We met another 3some who were going to hike the Shenandoah Mountain Trail and the Ramsey's Draft Trail. We exchanged pleasantries and said that we would hopefully see them along the Tearjacket Trail near the place we were going to camp for the evening. The first trail was the Bridge Hollow Trail. It was about 1.4 miles and went up about 800 feet. It was a moderate up but we handled it. We then intersected the Bald Ridge Trail, which we would be on for about the next 6 miles. We were ridging along this trail so we would go up, then down, then up, then down. It seemed the ups were longer than the downs. This section of trail did not seem utilized that much as there was alot of overgrowth. The views were few and, when there was one, it was obscured by the cloudy and overcast conditions that prevailed. The weather would alternate between some sun, some clouds, some breezes that we were sure would bring some rain, but didn't. The temperature was in the mid seventies. We ate lunch around 1ish along this trail. At around the 4 mile mark, the Wild Oak Trail came in from the right. We would be on this trail and the Bald Ridge Trail for about the next 2 miles as we ascended Big Bald Knob, the highest point on our hike at around 4,120 feet. We then descended this mountain and came to the intersection of the Tearjacket Knob or Hiner Spring Trail. After a short rest, we turned left along this trail and did another 1 mile up until we got to a nice grassy area with good campsites that contained Hiner Spring as well as the beginning of Ramsey's Draft. The Ramsey's Draft Trail also began at this point. We got there around 5PM. This gave us time to leisurely set up camp, eat and relax. While we were setting up camp, we noticed a deer grazing nearby. The deer would get very close to us and just stare, then she would wander around the perimeter of our camp, grazing and looking at us. Soon, more deer, including a little one still with spots, were slowly circling our camp and looking at us. We thought that they had become accustomed to humans and were looking for a handout. They circled all evening. So we ate, Frank made a great fire, even though things were still wet, and sat around the campfire and talked. The deer kept circling us at a safe distance. Finally, Christine threw an apple core at the deer that was the friendliest. She scarfed it up with one bite. We retired around 9ish. The stars were out and the night was a little cool. 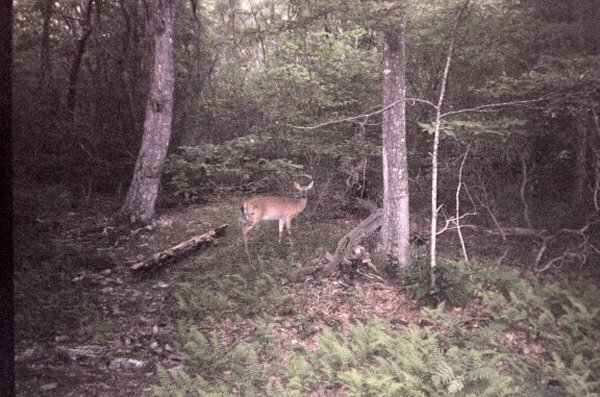 But we slept well and, other than hearing those deer still circling our campsite, which we had all to ourselves, the night was quiet and uneventful. 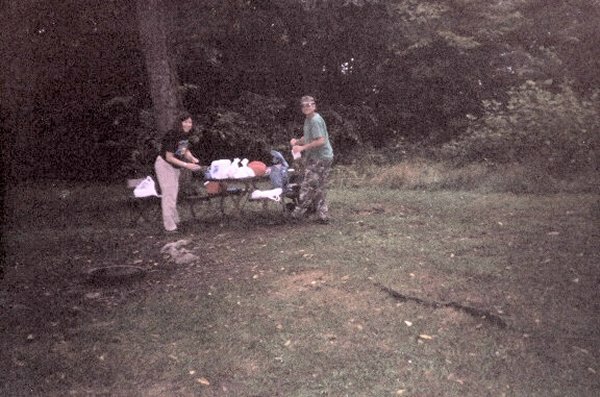 Sunday, 7/25/2004- We slept in until 6:30AM, ate, packed up and were on the Trail at around 9ish. We had discussed doing the Shenandoah Mountain to Road Hollow Trail route back, but decided to take the shorter Ramsey's Draft Trail back to our cars. We were concerned about the water level due to the big rains we experienced on Friday night. However, the water level was good and we did not get wet crossing the draft numerous times along this trail. The hike itself back to the car was all downhill, rocky and involved navigating some serious blowdowns as well as some stream fords. there were some great campsites along this stretch. 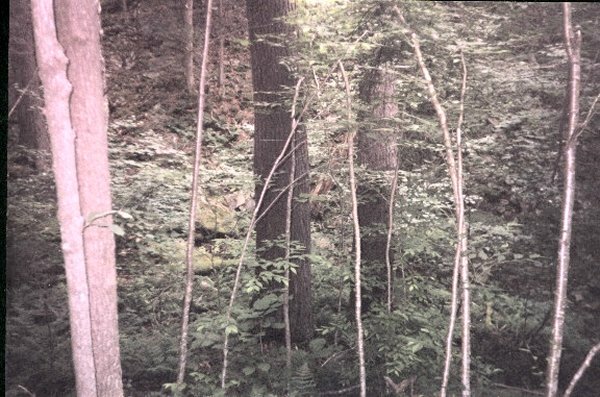 Some of the trees were huge in diameter (see pictures). It was a pleasant way to end this hike. We passed some people on horses as well as some day hikers and got back to our cars around 12ish. The 3some that we met yesterday got back at about the same time. They ended up doing the Road Hollow, Shenandoah Mountain, Jerrys Run and Ramseys Draft loop, which was about 8.3 miles. We decided that we can get 2 more backpacking trips out of this area. 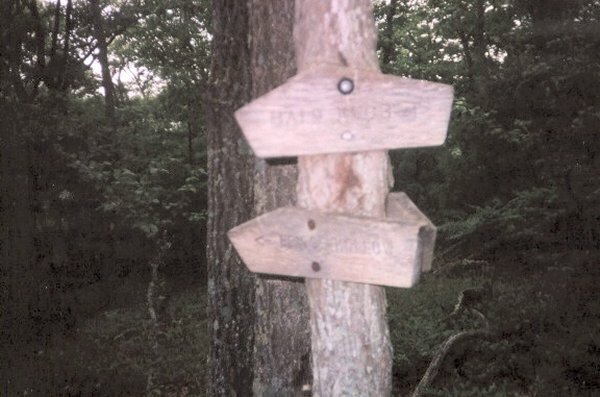 They include a loop consisting of the Road Hollow, Shenandoah Mountain, Tearjacket, and Ramsey's Draft Trail for about 15 miles and a linear hike consisting of the Shenandoah Mountain Trail for about 11 miles (13 if you include a side trail to Hiner Spring to Camp). We had a great weekend. 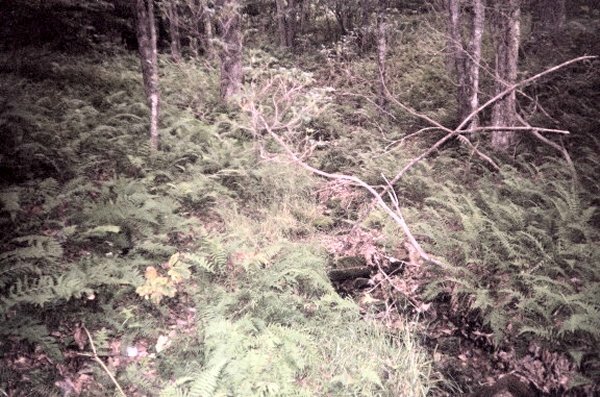 The Ramsey's Draft Wilderness is a neat place to spend some time away from the rat race and with nature. Frank & Christine @ Walnut Hills CG. Group picture before the hike. Bald Ridge & Bridge Hollow. Our campsite within Ramsey's Draft. The beginning of Ramsey's Draft. Huge trees along Ramsey's Draft.